I’ve always loved soup. Warming and simple, it was my favorite thing to make in culinary school. When I was a food critic, I judged chefs and restaurants on their soups since their simplicity can reveal a multitude of mistakes. To this day, I can tell when a restaurant cuts corners by purchasing frozen soup and pass it off as “Chef’s soup of the day.” It’s difficult to say how but it’s a consistency and salt thing. Such a shame to cut the soup corner… it’s really easy to make if you get the basics down. Onions, carrots (depending on the soup), celery and good stock (homemade if at all possible — Jamie Oliver has a good recipe for homemade chicken stock, albeit a double recipe). 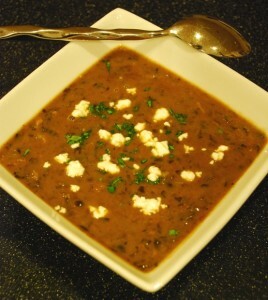 Most black bean soups start with dried beans, but in this one I use canned. Why? It’s easier and faster. And almost as cheap. Just be sure to wash them to remove the salt which can throw off your soup flavors. This recipe is also designed to be the main course with a simple salad as a side dish. Vegetarians and vegans can substitute vegetable broth and omit the prosciutto. Serves four. 1. In a dutch oven or large saucepan, heat olive oil. Add leek, onion and celery. Saute about a minute, then stir in chili powder and cumin. Sauté until the vegetables are soft, about 4-5 minutes, stirring often. 2. Add beans and mix well. Then pour in chicken stock. Bring to a boil and reduce heat to a simmer for 20 minutes. 3. Remove from heat. Using a hand or immersion blender, blend the soup until desired chunkiness. You can also use a regular blender and return the puree back to its original pan to finish. 4. Stir in prosciutto or ham and lime juice. 5. Add salt and black or white pepper to taste. 6. Garnish with cilantro and sour cream or goat cheese. Serve immediately. Freezes well too… if you have leftovers.